Timeliness of financial reporting is a qualitative characteristics that enhance the usefulness of information and significant to users of financial statements. Value theory is one of the fundamental problems of economics which is applied in many different disciplines. Drawing on the theory of planned behavior in entrepreneurship, the research proposes a model linking educational determinants, perceived entrepreneurial behavior control and entrepreneurial intentions. More than 40 years of establishing diplomatic relations and developing trade between Vietnam and Germany, it can be seen that Germany is the biggest trading partner of Vietnam in Europe and the largest importer of Vietnam’s exports to the EU. This paper explores the effects of labour movement into nonfarm activities on household production choices in rural Vietnam. Nowadays, Vietnamese women are participating actively in parts of the economy that were previously deemed male domain. This article studies whether firm-level and country-level factors affect a corporation’s debt maturity in the case of Vietnam or not. Local economic governance plays an important role in the development of the business sector. 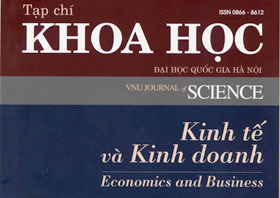 To assess its impact on business sector growth in Vietnam, this empirical study is conducted at the local level with all 63 provinces nationwide in the period from 2006 to 2014. 144 đường Xuân Thủy, quận Cầu Giấy, Hà Nội.